Small hidden recesses for the concealment of valuables or compromising deeds, etc., behind the wainscoting of ancient houses, frequently come to light. Many a curious relic has been discovered from time to time, often telling a strange or pathetic story of the past. A certain Lady Hoby, who lived at Bisham Abbey, Berkshire, is said by tradition to have caused the death of her little boy by too severe corporal punishment for his obstinacy in learning to write, A grim sequel to the legend happened not long since. Behind a window shutter in a small secret cavity in the wall was found an ancient, tattered copy-book, which, from the blots and its general slovenly appearance, was no doubt the handiwork of the unfortunate little victim to Lady Hoby's wrath. When the old manor house of Wandsworth was pulled down recently, upon removing some old panelling a little cupboard was discovered, full of dusty phials and mouldy pill-boxes bearing the names of poor Queen Anne's numerous progeny who died in infancy. 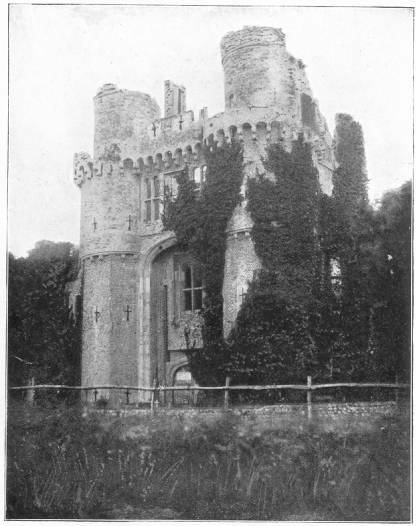 Richard Cromwell spent many of his later years at Hursley, near Winchester, an old house now pulled down. In the progress of demolition what appeared to be a piece of rusty metal was found in a small cavity in one of the walls, which turned out to be no less important a relic than the seal of the Commonwealth of England. Walford, in Greater London, mentions the discovery of some articles of dress of Elizabeth's time behind the wainscot of the old palace of Richmond, Surrey. Historical portraits have frequently been found in this way. Behind the panelling in a large room at the old manor house of Great Gaddesden, Herts, were a number of small aumbrys, or recesses. A most interesting panel-portrait of Queen Elizabeth was found in one of them, which was exhibited at the Tudor Exhibition. In 1896, when the house of John Wesley at Lewisham was pulled down, who should be found between the walls but the amorous Merry Monarch and a court beauty! The former is said to be Riley's work. Secretary Thurloe's MSS., as is well known, were found embedded in a ceiling of his lodgings at Lincoln's Inn. In pulling down a block of old buildings in Newton Street, Holborn, a hidden space was found in one of the chimneys, and there, covered with the dust of a century, lay a silver watch, a silk guard attached, and seals bearing the Lovat crest. The relic was promptly claimed by Mr. John Fraser, the claimant to the long-disputed peerage. Small hiding-places have been found at the manor house of Chew Magna, Somerset, and Milton Priory, a Tudor mansion in Berkshire. In the latter a green shagreen case was found containing a seventeenth-century silver and ivory pocket knife and fork. 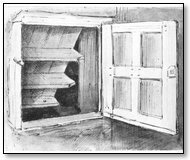 A small hiding-place at Coughton Court, Warwickshire, brought to light a bundle of priest's clothes, hidden there in the days of religious persecution. In 1876 a small chamber was found at Sanderstead Court, Surrey, containing a small blue-and-white jar of Charles I. 's time. Three or four small secret repositories existed behind some elaborately carved oak panels in the great hall of the now ruinous Harden Hall, near Stockport. In similar recesses at Gawdy Hall, Suffolk, were discovered two ancient apostle spoons, a watch, and some Jacobean MSS. A pair of gloves and some jewels of seventeenth-century date were brought to light not many years ago in a secret recess at Woodham Mortimer Manor House, Essex. A very curious example of a hiding-place for valuables formerly existed at an old building known as Terpersie Castle, near Alford, Lincolnshire. The sides of it were lined with stone to preserve articles from damp, and it could be drawn out of the wall like a drawer. 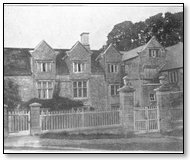 In the year 1861 a hidden receptacle was found at the Elizabethan college of Wedmore, Kent, containing Roman Catholic MSS. and books; and at Bromley Palace, close by, in a small aperture below the floor, was found the leathern sole of a pointed shoe of the Middle Ages! Small hiding-places of this nature existed in a wing, now pulled down, of the Abbey House, Whitby (in "Lady Anne's Room"). At Castle Ashby, Northants; Fountains Hall, near Ripon; Ashes House, near Preston; Trent House, Somerset; and Ockwells, Berks, are panels opening upon pivots and screening small cavities in the walls.